The Retrax Bed Cover is a retractable truck bed cover made of Lexan. The Retrax Bed Cover is the technological challenger of the Pace Edwards retractable tonneau cover. Retrax truck bed covers are made by Applied Products Inc. in Grand Forks, North Dakota. The company began the production of sliding tonneau covers in 1996 in a 10,000 sq. ft. facility and has since graduated to 45,000 sq. ft. of space in two buildings for production, finished parts, shipping and storage functions. The Retrax bed cover product line consists of two basic models - the RetraxONE and the RetraxPRO. The RetraxONE is made from a solid sheet of Lexan(polycarbonate)into which strong, tempered aluminum support beams are embedded. A spiral track system makes sure the Retrax truck bed cover retracts and rolls up into an 11 inch square compact storage canister. An aluminum railing system on ball bearing rollers helps make this process effortless. Tip: Use universal absorbent floor mats to reduce moisture, mud and gunk in your cab and truck bed areas. The tempered aluminum support beams are imbedded into the Lexan sheet to give it some load strength. The support beam and Lexan sheet recipe from Retrax is unique in the industry and in conjunction with the very liberal use of ball bearings creates a retractable truck bed cover that slides effortlessly and locks in any open position. Rubber seals and trim on the side prevent the incursion of dust and weather into your trucks bed. 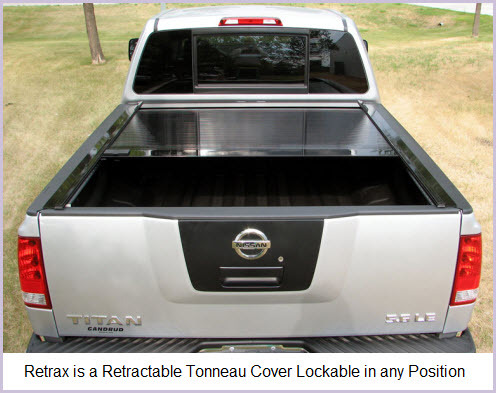 Retrax tonneau covers are made to roll easily with a light touch anywhere on the cover. And, remember, it’s made from Lexan, the stuff they use to make bulletproof glass. So it’s rugged and durable and immune to UV and all the stuff that normally destroys other plastic truck bed covers. But wait!!! You can even get a wirelessly operated electrically retractable Retrax Bed Cover that is made the same but opens with a slight touch of a button on the remote keyfob. The standard Retrax bed cover can literally be opened and closed with one finger, but, if you really don’t need the exercise … And if you're really into silver the RetraxONE comes in the Silver Model which replaces all powder coated parts with a silver coating. Talk about shiny!!! The RetraxPRO is very similar to the RetraxONE but the Lexan sheet is replaced with industrial strength aluminum slats. The slats are connected with hinges made of a long lasting extruded thermoplastic elastomer. The combo of aluminum slats and thermoplastic hinges gives the RetraxPRO the capability of supporting distributed loads of up to 500 lbs on top of itself. In addition, the RetraxPRO can be latched or key locked in most any position to give you some really unique hauling capabilities.